Beautiful and functional tiny spaces are continuing to pop up everywhere as potential living arrangements. Entire TV series are dedicated to them, decorating and storage how-tos are written for their specificity, and travel mags are showcasing breathtaking scenery the tiny homes have traveled to and parked in. It’s hard not to briefly consider the option, especially for young or childless military families. There is something to be said for having instant familiarity after each PCS. I admit they are gorgeous in both theory and appearance, but I haven’t been sold yet. Particularly for the reason I’ll leave to the end of this post, simply because if I don’t, your attention will permanently be diverted to a less than ideal scenario. However, it has to be a major consideration before living on wheels. A Little History of "Tiny Homes"
Mortgageless living is part of the American Dream for sure, and tiny homes can offer that security right off the bat or in the near future versus waiting the traditional 15 or 30 years. Zero house payment each month means more spending for experiences you love such as travel and cultural outings. Small space living was likely spurned from insecure economies in years past, but the advantages of this lifestyle will likely continue to pick up converts as the negative aspects of living tiny are eased through technical ingenuity and creative designs. Both concepts cozy up what is essentially a shed on wheels. Most recently, trends in in tiny living have come from a place of luxury. 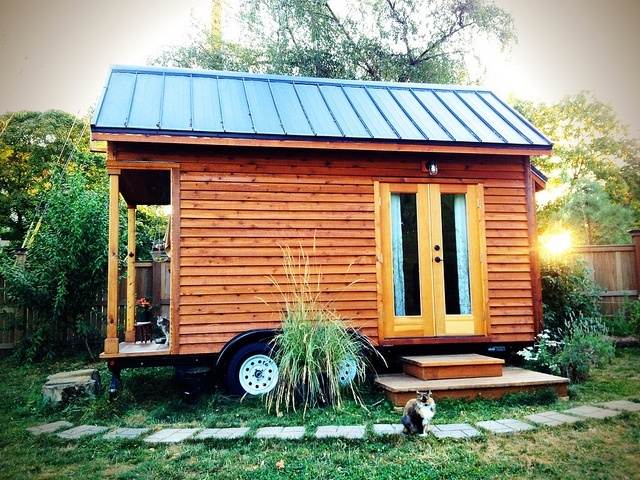 Tiny homes have strong roots in frugality and functionality, but as the movement has gained popularity, builders and buyers have taken comfort and decorating up a few notches. Appliance makers noticed and began creating small versions of their high-end refrigerators and washer/dryers. Stainless mini-fridge, anyone? Building budgets might include room for marble countertops, farmhouse sinks, standout wooden trim, and ceiling beams. Custom deck and roof top space are now more the norm instead of "we wish we had." Quality fabrics from pillows to window coverings also bring up the luxury quotient. Months ago, MilitaryByOwner posted the possibilities and advantages of working out of an office built from a customized shed in the back yard. No longer are these sheds simply office spaces; they have turned into a world of backyard entertaining. Imagine cocktail hours and dessert parties from a perfectly decorated shed with extending patios for a night out. Or, think about the benefits of football parties outside of the main house where half-eaten chicken wing bones and stinky cigars have their rightful place. Consider he/she sheds just another battle of the sexes, with both looking to extend versions of what makes them happy during their down time. Honestly, I think there's space for both football games, wine, beer, and desserts to co-mingle. Just no cigars, please. Although not portable like a tiny home, these personalized sheds remain on the main house’s property until a permanent move is scheduled. Depending on construction, they could be be packed and erected again at the next site. This brings me to the promised less-than-pleasant point of detail to portable living. Yes, if your house is on wheels, it is likely parked on a rented or borrowed piece of property or RV park. This means you probably don’t have access to a sewage system. Local laws and zoning do apply. The best way for me to describe the care, cleaning, and removal of toilet waste is to send you over to The Tiny Life, where many of the details are laid out if you so desire to know them. Without reading its entirety, the key terms to take away are: healthy diet, diaper, composting toilet, bagging your waste, bucket, and flies. Hey, if you can get past this, and many people do, the portable life just might allow for the financial freedom and personal satisfaction people these days are looking for. If not, keep searching MilitaryByOwner for homes to buy or rent with permanent waste management systems intact!